The OUC Orlando Half Marathon is my hometown half. 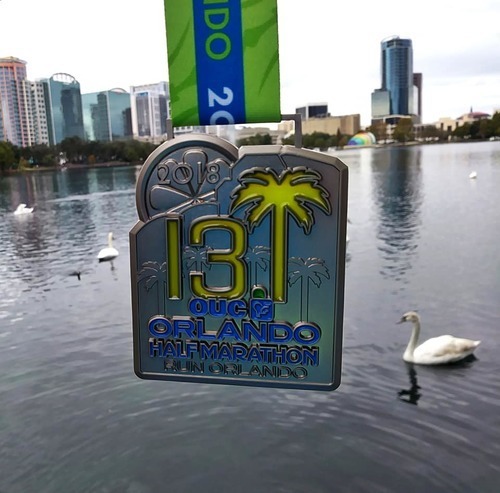 It's THE half marathon to run if you live in the Orlando area. And, if you are able to visit this time of year, you should run it! The race is put on by Track Shack, which always does an amazing job on their race events. 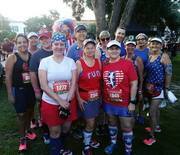 The OUC Orlando Half Marathon is in it's 42nd year and draws 5,000 runners each year to run it. In 2018, the race course was changed from previous years, removing about a mile of brick roads. The course contained approximately 1.6 miles of brick all in the first 5 miles. As someone who has run OUC four other years, this was definitely a plus! The race takes you through five downtown neighborhoods, and has live entertainment throughout. Support is scattered at about every 1 1/2 miles, with nine stops total. The volunteers manning the stops are awesome, some even dress up with themed costumes. The weather on race day this year was pretty good, we had temps in the low to mid 60s which was great considering this one can vary. You just never know in Florida this time of the year! The medal, as usual was awesome this year. I love how it's always so well themed to Orlando and Lake Eola which is so prominent. Post-race, there's great live music, beer and massages! You can also get some awesome photos with Lake Eola as the backdrop, as well as the beautiful swans. If you are a Central Florida local, you owe it to yourself to run this race! 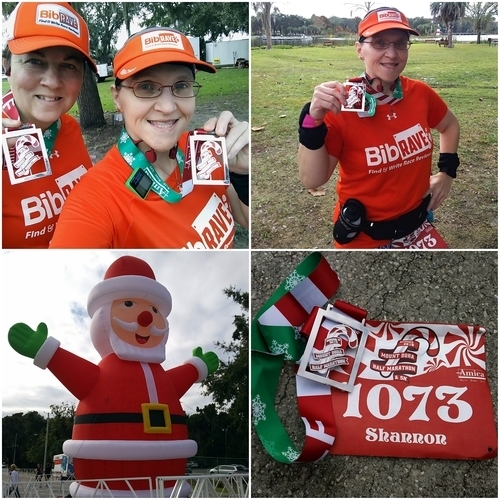 "Beautiful race through Mount Dora"
This was my second year running the Mount Dora Half Marathon, and this year, I ran it as a BibRavePro this year. I enjoyed the race a lot this year, it didn't feel as hard as last year to me. Ha! I think that having run in Atlanta back in October had my legs a bit more used to hills. Don't get me wrong, Mount Dora has some good hills (yes, there are hills in FL), but if you train for them, it's not too bad. The race itself is very scenic, I love the big old trees that line a lot of the route, and I especially enjoy the last few miles along the water. It's a highlight of running in the town of Mount Dora. On race morning, I found parking pretty easily, as there are a few public parking garages near the race start/finish area. If you get there by 6am, it's not an issue at all. Once you walk over to the starting area, there were port-o-lets and pre-race water and coffee. While there were more port-o-lets than last year, I do think they need to add more next year as the lines grew for the maybe 9 or 10 that they had. Race start went smoothly, and since it's not a huge race, about 1600 runners, it's easy to get moving right off the bat. I easily got into a groove with my pace because of this, so that was definitely nice! Through the miles, I enjoyed the scenery like I said prior, and that really makes Mount Dora special. It's a small town, and the race gives you that experience. Support throughout the route was great, the volunteers did a great job with water and Gatorade, I never saw any issues with anything running low, and I'm a slower runner. The only issue I saw out on the route was that while it was supposed to be a closed course, cars seemed to somehow get out on the road during the back miles. It was a little nerving as they got a bit too close in my opinion a couple of times. The finish is very cool, I love how it's Christmas themed, and there's a big inflatable Santa! Plenty of neat photo opps for everyone for the season. And, the medal was cute, a candy cane spinner. In prior years, the race shirt featured the iconic logo with the antlers, and this year it was totally different. It feels more like a summer shirt rather than a fun Christmasy one. I hope they bring back the holiday themed shirt in future years. 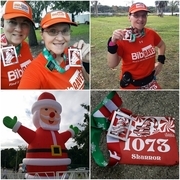 This year, the race seemed a bit less organized to me, and it was the 7th year for it. They changed the 5k from Sunday (same day as the half marathon), to Saturday, so that they could add on a two-race challenge. That's great, but this change was made sometime over the summer months, and communication on that was not as good as it should have been with folks running the 5k. Hopefully, since this was the first year for the two-race Dora Challenge, the organization on that will be better in 2019. A multi-race challenge is always fun, but needs to be planned well for runners and everyone to feel well prepared. I would go back and run this race again, as it's a local one for me. It's about a 40 minute drive, and I do enjoy running through Mount Dora. If you get the chance to run this one, especially the half marathon, I do recommend it! 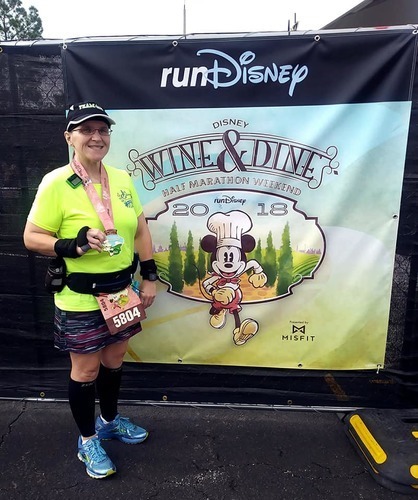 "Wine & Dine Half "
I ran the 2018 Wine & Dine Half Marathon as a pacer. While I have done the WDW Marathon Weekend Half a few times, Star Wars Half, and Princess Half, this was my first time running the Wine & Dine. Wine & Dine Half Marathon used to be a night race, but due to weather issues, runDisney changed it to a morning race in 2017. I do think it kind of takes away from the whole Wine & Dine experience, having it in the morning. This means that the after-party, which is held at the EPCOT Food & Wine Festival takes place that evening. So, you have the race in the morning, and party at night. Since I tend to be in a back corral, I wait awhile before starting. It's usually around 6:15am when my corral hits the starting mat. This year, it was a bit crazy weather-wise during the wait. We had coolish/nice temps, then it rained. Later, it got humid... so it was definitely a wacky morning. runDisney races are always a great time, with lots of characters along the way, and you get to see some of the parks. Not all of the 13.1 miles is in the theme parks though, as you run on roads as well, in between the more fun parks. The course can get a bit tight at times, especially at some of the turns and on/off ramps, so that's always something to keep in mind. I mean, there are thousands of other runners/walkers doing these Disney races! The best thing is to just go out there and run it for fun. Wine & Dine is overall a good race, but I'd have to say it wasn't my favorite half I've done out there. My favorite is the WDW Marathon Weekend Half Marathon, followed by the Star Wars: Dark Side Half Marathon. If you love the Food & Wine Festival though, this one might be right up on your favorites! This race is put on by the Atlanta Track Club and they do not disappoint! 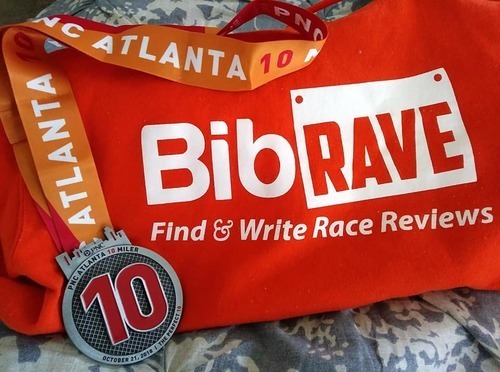 They put on top-notch events, and I got to experience that with the PNC Atlanta 10 Miler. As a Florida runner, the hills on this 10 mile route are no joke. I heard from the locals that this race are definitely one of the most challenging, and I believe it! My legs were definitely feeling the 785 feet of elevation gain. I highly recommend getting in lots of hill work before running it. I know I will next time! This race has amazing cheer zones, each one is themed. The consist of 10 local non-profit groups selected by the Atlanta Track Club Adopt a Mile program. Groups were super enthusiastic and I highly enjoyed them all. There were bananas, dinosaurs, butterflies and more! I loved them all. Atlanta Track Club donates up to $3,000 to each of the non-profits depending upon their level of assistance, participation, and enthusiasm. There is also a "Best of the Best" where event participants can vote and the winner gets a $500 prize. A big part of the 10 Miler is conquering Cardiac Hill. It's located at about mile two, and is the stretch of Peachtree Road that falls more than stories in elevation in less than one mile. The top 50 men and women who run down Cardiac Hill the fastest earn a prize. It's quite a challenging mile of the course, and I loved seeing all of the motivating signs along the way. It became my fastest mile of course, but nowhere near that of the top folks. Top men were starting at a 4:56 minute mile, and top women, 5:32 minute mile! Wow! "Hot, Fun Race for Watermelon!" This is my 4th year running the Watermelon 5k in Winter Park, Florida. This year, it was actually sponsored by Florida Hospital, and not Hunter Vision which is a change from previous years. Watermelon 5k is always well put on, as Track Shack Race Management truly is the best. The race has plenty of volunteers who truly are the greatest, and some awesome ice-cold watermelon to enjoy after you finish running 3.1 miles. The race begins on Park Avenue and goes down New York Ave through to Pennsylvania Ave, back to Park Ave, then off to Interlachen Ave, finishing right on Wellborne. It gives you a nice 3 mile "tour" of beautiful Winter Park. I always run this fun 5k with my running friends and even though it's a hot and sweaty one, i have a great time. We lucked out this year in that while it was humid, the sun didn't come out until right when we were head across that finish line. This isn't a timed race, as all of the Track Shack holiday races are for fun. You can come out and run, run/walk, or walk the event, whatever you'd like. Track Shack and the City of Winter Park encourages everyone to be able to complete the race within an hour, as the roads will begin to reopen not long after that time. If you're in Central Florida and looking for a fun 4th of July running event, this is definitely one to put on your list to come out and do!